At 10 pm tonight a student was reportedly running through Vedder Quad and Vedder and Smith Halls, pushing over students and wreaking havoc on unlocked dorms. Supposedly, he's missing clothes, though that hasn't been confirmed. Public Safety arrived on the scene when a drunk man was reported to be scaling the roof. They haven't caught him and are still searching. 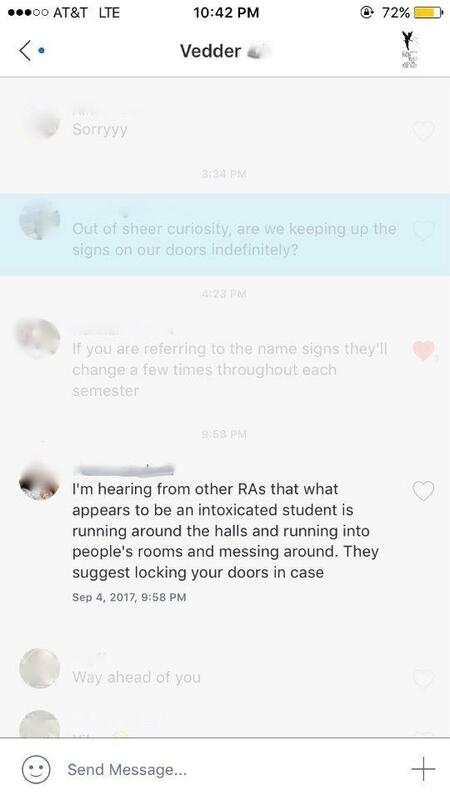 According to a GroupMe for students living in Vedder, the student in question may have been drinking earlier that night. "What appears to be an intoxicated student is running around the halls and running into people's rooms and messing around," read a text. "[RA's] suggest locking your doors in case." Students around Vedder and Smith originally noticed a tall, blonde student with one flip-flop (the other was picked up by an RA when he lost it) running around campus away from P-safe. Residential advisors alerted their students, warning them that the student was knocking people over and damaging rooms.